Real people. Real problems. Real talk. Normally, therapy sessions are totally confidential -- but this podcast opens the doors. Hillary McBride and her clients want to help demystify mental health. No actors. No auditions. No artifice. First Day Back is a podcast from Stitcher about people facing and trying to overcome life's most challenging moments. Last season followed a woman coming back from her prison sentence. Now the show is back with a new story about a comedian who died on stage and was revived by an audience member. Follow along this season to find out how the man who lives and died for comedy grapples with his death and reignites his career in the aftermath. Recorded in front of a live theatre audience at the HotDocs Podcast Festival, Hillary McBride discusses how our families shape us for better and for worse by digging deeper into Sloane's story and her own. Featuring special expert panellists Kwame McKenzie and Tina Malti. *Warning: This episode references suicide and may be triggering for some listeners. When someone you love is suicidal, talking about it is daunting. In this podcast extra, host Hillary McBride, producer Jodie Martinson, and expert guest Lu Ripley get real about how to have candid conversations and ask that terrifying question: "Do you want to kill yourself?" *Warning: This episode references suicide and may be triggering for some listeners. Belle is feeling suicidal and like a bad parent. Hillary talks with her about the idea of a "good enough" mom. Hannah's anxiety is out of control and that's making it hard to get through her day at work. Host Hillary McBride advises her client Hannah to listen to a guided mediation on her commute to help ease her anxiety. Here's one for you to use, with Hillary as your guide. Hillary works with Ethan to imagine playing and connecting with his new baby. He's worked for years to process the terrifying experience of almost losing his wife during the birth of their first child. *Warning: This episode details a sexual assault and may be triggering for some listeners. A chance encounter at the pool has triggered Layla to remember a sexual assault. In this session, she begins to heal. Ellie's decision to leave her abusive relationship has restored her sparkle. But how does she foster a good relationship between him and their daughter without getting hurt again? Producer Jodie Martinson shares some clips from new therapy sessions between Hillary and her clients about healing from sexual assault, escaping domestic violence, and carrying hurt into new love. New episodes will be released in the fall. If you liked how Other People's Problems let you into the minds and hearts of ordinary people you'll love Mic Drop. Listen in as teenagers share their mood-swinging, dream-chasing, rule-breaking dramas and adventures. Patti strives to be perfect and does so much for her son and husband. Hillary helps her see that giving even more is not the answer. Hillary introduces Sloane to the idea of Complex Post-Traumatic Stress Disorder to help her understand why she feels so overwhelmed at times. But will the diagnosis help Sloane feel more or less empowered to change? 'Maggie' talks with OPP creator and producer Jodie Martinson about what it was like to be a part of the podcast, and how the microphone in the room affected her. Franklyn revokes his access to tracking his ex-wife's whereabouts through her phone. It's his last connection to her. Megan and Clark are going through some major life changes. Clark welcomes the change. Megan is supportive yet can't help but miss what's been lost along the way. 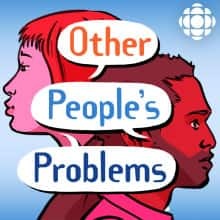 Creator and producer of Other People's Problems Jodie Martinson sits down with Hillary to explain how OPP was made, and what challenges they faced in putting it together. Sloane is planning her wedding, but childhood memories make her fearful of what could go horribly wrong. Although she's excited to start a new stage of her life, she's having nightmares of her wedding day. They all revolve around her mother. Normally, therapy sessions are totally confidential. Hillary McBride and her clients want to help demystify mental health. This is what people really sound like when they talk about traumatic births, turbulent divorces, eating disorders and tough childhoods.